3. A Dharma Path comes in two type. One type is What You Want a Trait to Become. 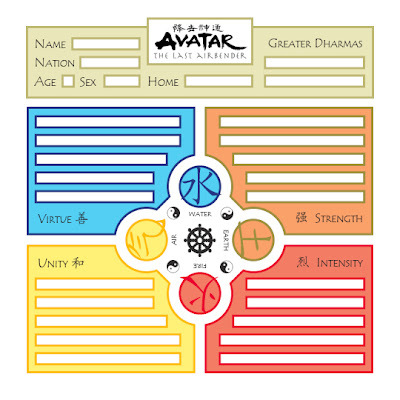 For example, if my character has the trait “Beginning Firebender” I might create a Dharma Path called “Become A Firebending Master.” The other type of Path involves Creating a New Trait and are much more common when you first start playing the game. When creating a Path for the second type, just name a trait that your character wants to gain, like “I Want to Learn to Love My Siblings.” In either case Dharma Paths represent the metaphorical paths my character wants to go down. Dharma Paths are named from the character’s perspective, usually, not the player’s. You can’t have a Path like “I Want to Discover That My Father’s a Murderer” unless your character has some reason to suspect the crime. You could have, however, something like “I Want to Figure Out Why My Father Can’t Sleep At Night.” Be creative.